Today password strength is extremely important to keep your data secure. As web developers/designers we need a way to show our users the strength of their password. Below is a list that will allow you to add a Password Strength meter to your website. Password Strength Meter like Google – This script is built with no framework. It works based on a point value that as you use different variations of letters, numbers and symbols your password will be stronger. This script is completely free to use on any project you wish. Password Strength Meter – This Password Strength Meter is based on a point system. Its main goal is to help the end user with a stronger password. It is very detailed and it might be over detailed but it is one of the best I’ve seen. It is also written with no framework. ColdFusion Password Strength – This Password Strength meter works fairly well. When you first type in the password field it tells you what you need to make a strong password. Since I haven’t seen another ColdFusion Password Strength scripts I think this would be a nice add for ColdFusion Developers. Prototype/Scriptaculous Password Strength Meter – This script is written with prototype and scriptaculous. It is a very strong password strength script works very similar to all the others. It uses a point system to calculate the strength of your password. JQuery Password Strength Meter – Password Strength Meter is a jQuery plug-in that provides a smart algorithm to detect a passwords strength. The Password strength works on a point structure that if you pass a certain test than more points will be added and in turn your password will be more secure. Another JQuery Password Strength Meter – JQuery password strength meter is a small plugin to jQuery that provides an easy way to show the strength of a user’s (intended) password. It is very easy to implement and I think you should check it out. If you have any more scripts please comment below. 7 Password Strength Scripts | WebTecker the latest tech, web resources and news…. 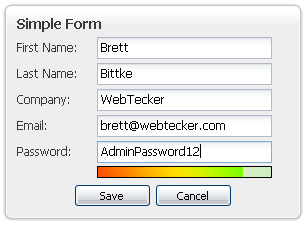 List of Free Online Password Managers | WebTecker the latest Web Tech, Resources and News. In what way is the “ColdFusion Password Strength”, ColdFusion powered? All I can find in the enclosed ZIP file is client-side code. Has it been changed recently? The public API will be live soon so it will provide a much more robust checking (against English words, combinations, sequences etc). Thanks for sharing such a nice topic that can be discuss to everyone. Just a note to let people know that the “Password Strength Meter Like Google”, located at http://www.codeandcoffee.com/2007/07/16/how-to-make-a-password-strength-meter-like-google-v20/ is not working. I wish that it was because it is exactly what I am looking for. If anyone knows of another link to download that code (or one like it), please post it on this forum! none of these calculate the password entropy. Need some way to calculate that. I have page with four simple tab navigation and all the tabs are forms.